Image caption Alfie Evans suffers from an undiagnosed neurological degenerative condition. 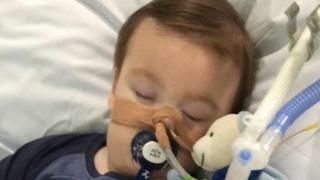 The parents of terminally ill Alfie Evans have been refused permission to appeal to the Supreme Court over a decision to withdraw his life support. The 22-month-old is in Liverpool's Alder Hey Hospital with an undiagnosed degenerative brain disease. Doctors say there is nothing they can do for him but Tom Evans and Kate James have fought a long legal battle to keep him on a ventilator. They will now consider applying to the European Court of Human Rights. Mr Evans and Ms James want the hospital to keep treating Alfie so they can eventually take him abroad for treatment. High Court judge Mr Justice Anthony Hayden ruled last month that the hospital can move him to palliative care. Mr Evans and Ms James challenged the decision at the Court of Appeal but it was upheld by Mrs Justice King, who agreed Alfie should receive palliative care. The Supreme Court rejected their claim that the previous courts have discriminated against them, contrary to the European Convention on Human Rights. Court papers said the parents wanted continued care so Alfie could be taken by air ambulance to a hospital in Rome and perhaps later to a hospital in Munich. If there was no prospect of his condition improving after "about six months" they would "with whatever degree of difficulty" accept withdrawal of his life support. Rules meant that Alfie parents could not simply ask Supreme Court justice to consider the case. A Supreme Court spokeswoman said that justices had rejected the couple's bid after analysing written arguments from everyone involved. Video Tom Evans says: "Alfie's not ready so we're not ready to let go"